" Abraham and Straus - Brooklyn, NY - C. 1901 to 1907 (Undivided Back). " 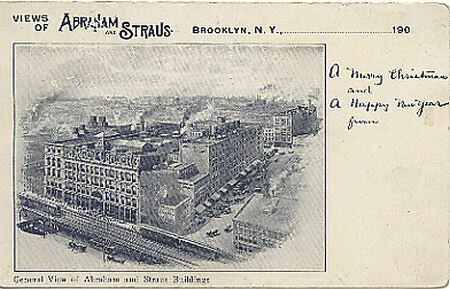 (1760) POSTCARD: Abraham and Straus - Brooklyn, NY - C. 1901 to 1907 (Undivided Back). -Condition: Very Good. - Not Posted. Picture of the factory with "A Merry Christmas and A Happy New Year" printed in cursive on the side of the card. Evidently was a company Christmas Card. Abraham and Straus was founded in 1865 as Wechsler & Abraham. In 1893 The Straus Family who was connected to Macy's Department Stores bought Joseph Wechsler's interest and the company acquired the name of Abraham and Straus. In 1995 the name was dropped. In 1893 an article stated that there were about four and 1/4 miles of shopping floor within five stories, a basement and a cellar. It also stated that the firm had the largest private electric plant in the world! There were 1,600 employees and had an average of 40,000 shoppers visit each day! Quite a store for the times. Price: $6.00 + shipping.